Peterson Air Force Base, Colorado. 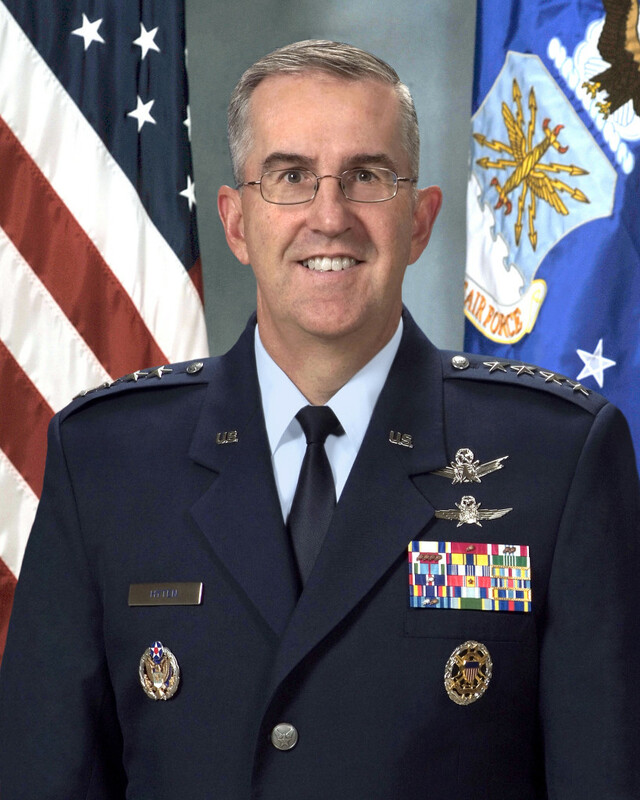 August 15, 2014 – General John E. Hyten became the 16th commander of Air Force Space Command, in a change-of-command ceremony today, replacing General William L. Shelton. General Mark A. Welsh III, Air Force Chief of Staff, presided over the ceremony. General Hyten attended Harvard University on an Air Force Reserve Officer Training Corps scholarship, graduated in 1981 with a bachelor’s degree in engineering and applied sciences and was commissioned a second lieutenant. General Hyten’s career includes assignments in a variety of space acquisition and operations positions. He served in senior engineering positions on both Air Force and Army anti-satellite weapon system programs. General Hyten became AFSPC Commander after serving as vice commander. The general’s staff assignments include tours with the Air Force Secretariat, the Air Staff, the Joint Staff and the Commander’s Action Group at Headquarters Air Force Space Command as Director. He served as mission director in Cheyenne Mountain Air Force Station and was the last active-duty commander of the 6th Space Operations Squadron at Offutt AFB, Nebraska. In 2006, he deployed to Southwest Asia as Director of Space Forces for operations Enduring Freedom and Iraqi Freedom. General Hyten commanded the 595th Space Group and the 50th Space Wing at Schriever AFB, Colorado. Prior to assuming his current position, he served as Director, Space Programs, Office of the Assistant Secretary of the Air Force for Acquisition, Washington, D.C.
As commander of AFSPC, General Hyten is responsible for organizing, equipping, training and maintaining mission-ready space and cyberspace forces and capabilities for North American Aerospace Defense Command, U.S. Strategic Command and other combatant commands around the world. General Hyten also oversees Air Force network operations; manages a global network of satellite command and control, communications, missile warning and space launch facilities; and is responsible for space system development and acquisition. Created on September 1, 1982, AFSPC provides military focused space capabilities with a global perspective to the joint warfighting team and is the Air Force lead in developing cyberspace capabilities. Providing an integrated constellation of space and cyberspace capabilities at the speed of need, the command delivers responsive, assured and decisive power to America and its warfighting commands. AFSPC is comprised of more than 42,000 professionals, assigned to 134 locations worldwide.